It’s hot in Berlin! Very hot! 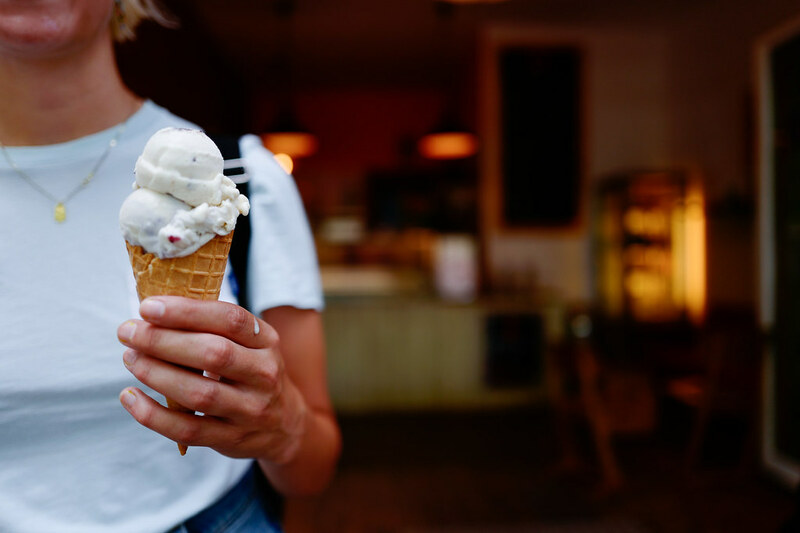 For us, the only reasonable thing to do in this heat is to cool ourselves with some good old gelato… everyday 😉 Good thing Berlin loves ice cream!There’s plenty of picky-friendly and even fully vegan ice cream parlors all over Berlin, offering a huge variety of creative and authentic flavors. Here are our current favorites! During my ice cream research, I was looking for a place that offered handmade cones. I found Jones Ice Cream in Schöneberg that was established by passionate pastry chef Gabrielle just two years ago. They have an amazing variety of flavors (sorbets being vegan, the rest dairy-based): Peanut Butter & Jam over Whiskey Pecan over to Grapefruit Earl Grey and also Home-made Cookies! We went for Lemon Mint, Passion Fruit Yogurt and Lemon Pie. My top highlight was definitely Lemon Pie, it was incredibly creamy and soft and it had little pieces of meringue and lemon cream in it. So freakin’ delicious. The crispy fresh cone completed an amazing ice cream experience – really the best I have had in quite a while. Jones Ice Cream, Goltzstraße 3, 10781 Berlin. Website. My absolute favorite ice cream parlor has to be near my home, so I can eat ice cream every day during the summertime. There’s two places I’d like to tell you about! First, Balaram Vegan Ice Cream at Boxhagener Platz in Friedrichshain. 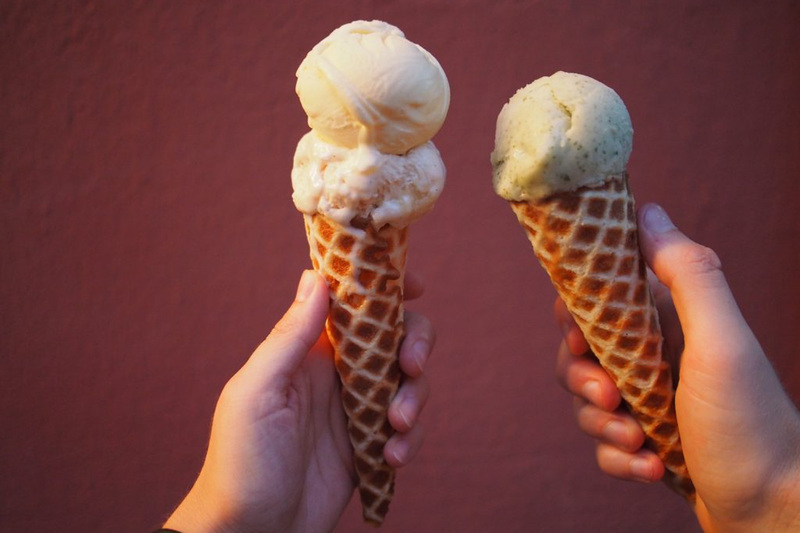 The small parlor is a vegan ice cream heaven, you can choose between typical sorbet varieties and also crazy flavors like New York Cheesecake, Lemon Buttermilk or Blueberry Lavender. And the cones are also vegan! Heaven. Balaram Vegan Ice Cream, Gabriel-Max-Straße 17, 10245 Berlin. Website. The second one is a new store where you can eat ice cream in a roll. 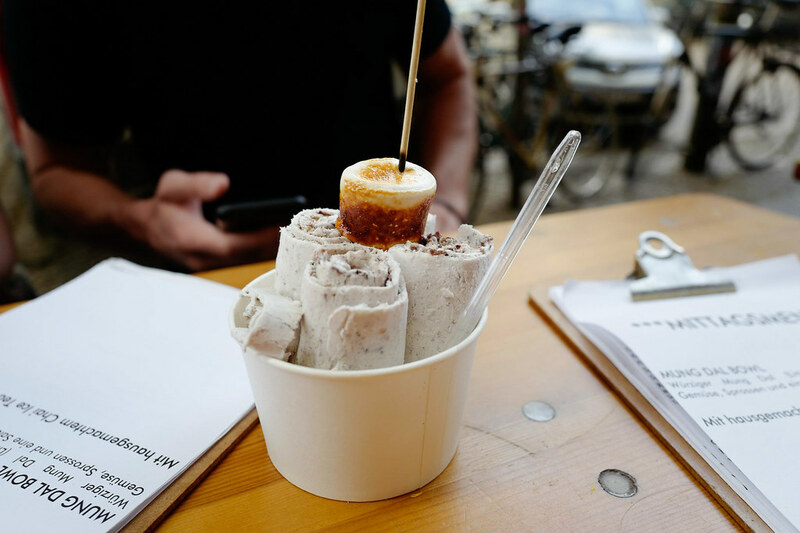 Delabuu Ice Cream is Berlin’s first cold plate ice creamery. You can choose between a huge selection of sweet, fresh and organic ingredients, many of them vegan. It tastes really delicious! As an advice, choose the small size, it’s more than enough. Delabuu Ice Cream, Krossener Str. 15-18, 10245 Berlin. Website. Mos Eisley is a small (unfortunately not really Star Wars-themed) ice cream parlor in my beloved Schillerkiez in Neukölln. 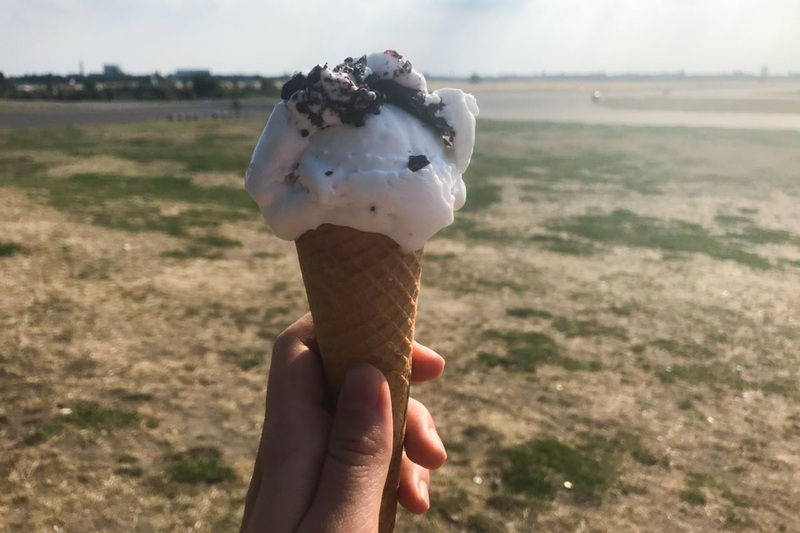 It’s the perfect spot in the neighborhood to get delicious gelato to take with you to Tempelhofer Feld, which is only 2 minutes away. All flavors are fresh and self-created! They always offer a variety of vegan sorbets and one or two plant-milk based flavors, like Coconut & Chocolate Chunk (in this picture) or Soy Peanut Crunch. The cones are vegan as well. Bonus: You can get sprinkles for free! Mos Eisley Gelateria, Herrfurthplatz 6 , 10249 Berlin. Website.